Gabe Ignatow, Rada F. Mihalcea, "An Introduction to Text Mining: Research Design, Data Collection, and Analysis"
Students in social science courses communicate, socialize, shop, learn, and work online. When they are asked to collect data for course projects they are often drawn to social media platforms and other online sources of textual data. There are many software packages and programming languages available to help students collect data online, and there are many texts designed to help with different forms of online research, from surveys to ethnographic interviews. But there is no textbook available that teaches students how to construct a viable research project based on online sources of textual data such as newspaper archives, site user comment archives, digitized historical documents, or social media user comment archives. 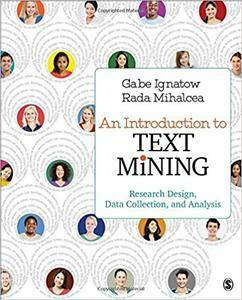 Gabe Ignatow and Rada F. Mihalcea′s new text An Introduction to Text Mining will be a starting point for undergraduates and first-year graduate students interested in collecting and analyzing textual data from online sources, and will cover the most critical issues that students must take into consideration at all stages of their research projects, including: ethical and philosophical issues; issues related to research design; web scraping and crawling; strategic data selection; data sampling; use of specific text analysis methods; and report writing.